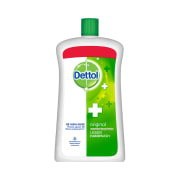 Dettol Original Liquid Handwash is specially formulated to protect the skin from 100 illness-causing germs. Protects against everyday germs infections including skin infections, respiratory infections (Influenza), gastroenteritis (such as Salmonella and Escherichia Coli) etc. A licensed pharmacy from your nearest location will deliver Dettol Original Liquid Handwash. Once the pharmacy accepts your order, the details of the pharmacy will be shared with you. Acceptance of your order is based on the validity of your prescription and the availability of this medicine.